I don’t know about you, but I love watching the Track and Field Championships. One thing I find fascinating is how many athletes look around to see where they stand in comparison to their competitors while they are still running the race! The problem with not fully concentrating until you cross the finish line is that the 0.3 seconds it took you to turn your head could cost you the event! Recently one of my athlete patients who reported 90% improvement with Prolotherapy told me, “I’m not stopping Prolotherapy until I cross the finish line!” This is good advice for every athlete. Do not stop treatments until you are back at your sport 100%. For an athlete to completely recover from an injury, the strength of the injured tissue must have fully recovered – 100%. How will an athlete know the injury is 100% cured? The best evidence of a full cure is the athlete’s ability to compete or train fully in his/her sport at pre-injury level without medications!The key to maximizing an athlete’s healing ability is to avoid anything that will hamper healing such as taking nonsteroidal anti-inflammatory medications (NSAIDs). I would encourage all athletes and doctors who treat athletes to please read the article in this issue regarding the comprehensive review describing how NSAIDs accelerate the progression of degenerative arthritis. As they say, one picture is worth a thousand words! NSAIDs cause significant cartilage breakdown like that shown in Figure 1. Whether you have medical training or not, the fraying of articular cartilage is evident in this patient’s knee as seen through an arthroscope. If an injured athlete (or any patient for that matter) takes an anti-inflammatory medication and then competes in an event or training because the pain has been muted, the end result is likely going to be long term acceleration of the arthritic or degenerative process in the injured joint/tissue. Figure 1. A picture is worth 1,000 words. This is a knee from the view of an orthopedic surgeon under arthroscopy—frayed and degenerated. In the short term, the athlete is inhibiting the tissue from repairing by taking NSAIDs. If the tissue involved is a ligament, an unstable joint results. Exercising on an unstable joint will lead to degenerative arthritis very quickly. Dr. Mark Wheaton and Nichole Jensen provide a phenomenal in-depth review revealing how ligament injury is the precursor to degenerative arthritis. 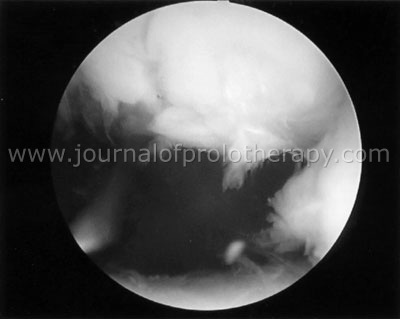 In their abstract they write, “Being that ligament injury, excess laxity, joint hypermobility, and clinical instability are known to be major causes of osteoarthritis, any treatment which can address restoration of ligament function would help reduce the incidence, pain, and dysfunction of osteoarthritis.” This provides one of the primary rationales for using Prolotherapy in degenerative joint and spinal disease. The Journal of Prolotherapy is excited to have Babette Gladstein, DVM, join the board and writing team as a regular columnist. There are only a handful of holistic vets in the country, even fewer who do Prolotherapy. While the mission of JOP remains to educate the world about the life-changing effects of Prolotherapy, realize this does not just apply to treating human musculoskeletal ailments. What could prove the effects of Prolotherapy more clearly than Prolotherapy helping injured animals recover their jumping, walking, and stair-climbing abilities? Dr. Gladstein leads a team of veterinarians, Shaun Fauley, DVM and Roger DeHaan, DVM in a presentation of successful Prolotherapy case studies. Thank you, Dr. Gladstein, and welcome to JOP! Gary Clark, MD discusses Prolotherapy and athletic injuries in his literature review column, including a case study of an injured hockey player who, fortunately for his team, found Prolotherapy. InRemarkable Recoveries we feature case study contributions from Paul Kramm, MD on some of his professional athlete patients who have received Prolotherapy. Cathy Skinkis reports on a 69 year-old marathon runner whose only hope at running again was Prolotherapy. Tim Special, DO presents his own personal story of success with Prolotherapy, in Letters to the Editor. Also, a former patient of Dr. Hemwall, Barbara Young, shares her experience with Prolotherapy. Whether a professional athlete with an injury, or a patient suffering with pain from overuse, elbow injuries are a major problem for many people. In this issue, JOP columnist, Rodney Van Pelt, MD guides the practitioner through Prolotherapy to the elbow. JOP reaches the West Indies in a Wide, Wide World article by Dr. J. Humphreys. It is exciting to see Prolotherapy in action in the Caribbean—nice work Dr. J! Figure 2. This is the cover of the Korean translation of Prolo Your Pain Away! We are glad a lot of patients in South Korea are doing just that! Also included in this issue is an interview with personal injury attorney Steven Crifase regarding his experience with the current legal climate of orthopedic surgeries with poor results. Along those very same lines, we present a study of 34 patients in a private Prolotherapy office who were told by other doctors that surgery was their only option. The results proved to us that Prolotherapy is a very viable option, even when someone gets to the point of surgery being the only option offered by their traditional medicine physician. As you can see, we have a packed special edition issue to kick off our 2010 volume of the Journal of Prolotherapy®! Enjoy!